Corktown is a historic district located just west of Downtown Detroit, Michigan. It is the oldest extant neighborhood in the city. The current boundaries of the district include I-75 to the north, the Lodge Freeway to the east, Bagley and Porter streets to the south, and Rosa Parks Boulevard (12th Street) to the west. The neighborhood was listed on the National Register of Historic Places in 1978. The Corktown Historic District is largely residential, although some commercial properties along Michigan Avenue are included in the district. The residential section is listed on the National Register of Historic Places and is designated as a City of Detroit Historic District. The neighborhood contains many newer homes and retains some original Irish businesses. The Great Irish Potato Famine of the 1840s resulted in extensive Irish migration to the United States and Canada. By the middle of the 19th century, they were the largest ethnic group settling in Detroit. Many of these newcomers settled on the west side of the city; they were primarily from County Cork, and thus the neighborhood came to be known as Corktown. By the early 1850s, half of the population of the 8th Ward (which contained Corktown) were of Irish descent. Historically, the neighborhood was roughly bounded by Third Street to the east, Grand River Avenue to the north, 12th Street to the west, and Jefferson Avenue/Detroit River to the south. By the Civil War, German immigrants had begun making inroads into the Corktown neighborhood. Many immigrants had come from German provinces after the revolutions of 1848. By the turn of the century, the original Irish population had diffused through the city, and new immigrants, notably Mexican and Maltese, moved into this older housing. As the century progressed, migrants from the American South, both black and white, were lured by the jobs in the automobile industry and also went to the city. By the middle of the 20th century, the area of Corktown was reduced through urban renewal schemes, the building of light industrial facilities, and the creation of the Lodge Freeway and Fisher Freeway. Tiger Stadium was in Corktown at the corner of Michigan Avenue and Trumbull Street until its demolition in 2009. The UIS Irish Plaza is a park and memorial dedicated to honoring Metro Detroit's Irish immigrant community and their descendants. Corktown has seen a number of revitalization projects since 2005. These include the United Irish Societies Irish Plaza,, dedicated in 2006; the 66,000-square-foot Quicken Loans Technology Center, opened in 2015; and the Detroit Police Athletic League (PAL) headquarters, and youth sports facility at the old Tiger Stadium site at Michigan and Trumbull Avenues, developed in 2016. Opposite the PAL facility, a $37-million mixed-use development, The Corner, with 111 apartments, broke ground in early 2018. Also in 2016, the new Trumbull & Porter boutique hotel opened after a $10 million renovation; and in 2017, Soave Enterprises broke ground on Elton Park, a $150 million, 420 apartment mixed-used development. Built in 1913, the historic Michigan Central Station served passenger traffic until 1988, after which it was abandoned. It was purchased by Ford Motor Company in May 2018. It is undergoing a significant four-year renovation for mixed-use development. A major redevelopment push in the area was started by the Ford Motor Company, which began development on an urban campus in Corktown in 2017 with its purchase, renovation and occupation of The Factory building at Michigan Ave. and Rosa Parks Blvd. Ford later bought other parcels of land in Corktown, including the Michigan Central Station and the adjacent Roosevelt Warehouse. Ford plans a new $740 million Corktown campus, including 1.2 million square feet of mixed-use development spread over the Michigan Central Station, Roosevelt Warehouse, the Factory building at 1907 Michigan Avenue, and build a new mixed-use 290,000-square-foot, four-story building on the vacant brass factory building site, known as "The Alchemy", at 2051 Rosa Park Blvd. Ford also announced plans to build two new parking structures. The focus of the Corktown campus will be on autonomous vehicles and electric vehicles. Ford expects to move 2,500 of its employees to the campus with space for an additional 2,500 entrepreneurs, technology companies and partners related to Ford's expansion into Autos 2.0. Ford is also seeking $104 million in tax breaks from the city as part of a $250 million incentive package over 34 years. The original buildings in Corktown are Federal-style detached homes and rowhouses built by Irish settlers. A worker's row house circa 1840 is located on Sixth Street and is one of the oldest existing structures in the city of Detroit. In later years, modestly sized Victorian townhouses with Italianate, Gothic, and Queen Anne elements were constructed in the district. Residents are zoned to Detroit Public Schools. Residents are zoned to Owen at Pelham and King High School. The Roman Catholic Archdiocese of Detroit operates the Most Holy Trinity School in Corktown. It is one of the four remaining Catholic grade schools in the city. ^ a b c d e f "Greater Corktown Development Corporation". Archived from the original on 2010-12-03. ^ Hayes, Dennis (May 16, 2006). "Plaza erected in Corktown to honor Irish heritage". Model D. Detroit, Michigan: Issue Media Group. Retrieved October 26, 2017. ^ "Construction Underway On New Quicken Loans Technology Center"
^ "Detroit PAL to use artificial turf at stadium site". ^ "Corktown hotel gets $7.85 million loan to complete renovations". ^ "Red Dunn Kitchen opens in Corktown". ^ "$150 million Elton Park project breaks ground in Corktown". May 8, 2017. ^ "How Ford plans to use its new Corktown digs". Crain's Detroit Business. 2018-01-21. Retrieved 2018-06-19. ^ "Ford's future: Train station to be part of new transportation model". Crain's Detroit Business. 2018-06-16. Retrieved 2018-06-19. ^ "Ford would demolish this vacant Detroit building". June 21, 2018. ^ "How Ford plans to resurrect the train station". Detroit News. Retrieved 2018-06-19. ^ "Ford Motor Co. to spend $740 million on Corktown campus". August 14, 2018. ^ "Interactive Map". Greater Corktown Development Corp Retrieved on April 24, 2009. ^ "Owen MS Attendance Area." Detroit Public Schools. Retrieved on April 24, 2009. ^ "M. L. King HS Attendance Area." Detroit Public Schools. Retrieved on April 24, 2009. ^ "Detroit area's Catholic schools shrink, but tradition endures"(Archive). Detroit Free Press. February 1, 2013. Retrieved on September 13, 2014. ^ "Detroit City Council Biography." Sheila Cockrel. Retrieved on April 25, 2009. 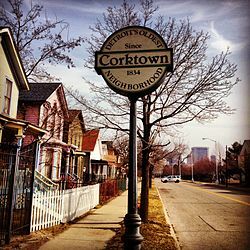 Wikimedia Commons has media related to Corktown, Detroit.